Conversations is an occasional item conducted by Mike Feeney from time to time as the opportunity arises. In this inaugural article, Mike with Captain (retired)Maurice E McGreal, now of Auckland. Mike Feeney heads south for this month's column and takes a look at the South Otago Aero Club. 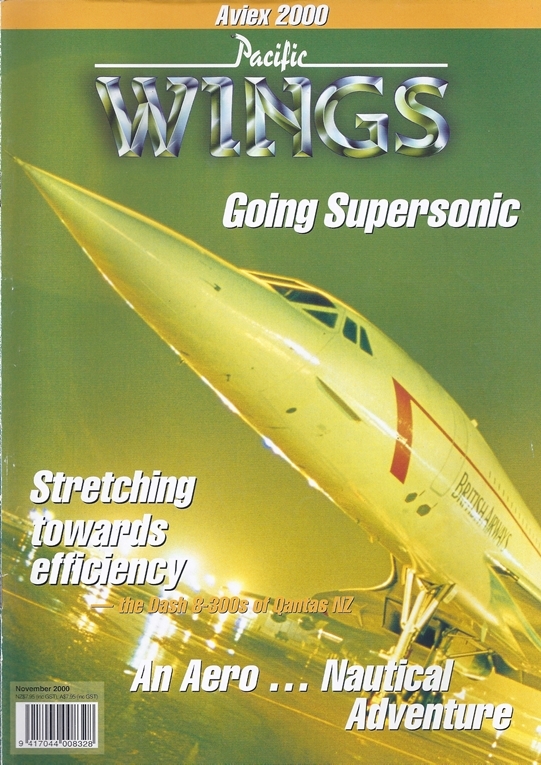 With the future of Concorde uncertain Peter Clark recalls a trans-Atlantic flight he made on the supersonic wonder in 1997. The editor profiles Flight Test New Zealand. Peter Clark writes of Qantas New Zealand's Dash 8.300s after he flew in the jump seat of the airline's service from Dunedin to Christchurch. Mustering animals is a part of life for many people living in rural Australia and on properties where a single paddock can be tens of thousands hectares, the aircraft has found its home. By Debbie Dowden. Nigel White reports on the recent New Zealand Agricultural Aviation Association conference. Murray E Kirkus visited what is hailed as the largest general aviation exhibition in the Southern Hemisphere, Aviex 2000, and filed this report.